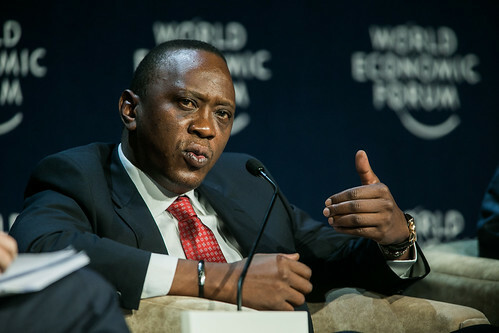 Uhuru Kenyatta, President of Kenya. Photo: World Economic Forum/flickr. Kenya wants the United Nations Security Council to halt the trials of President Uhuru Kenyatta and Deputy President William Ruto. With the African Union at its side, Kenya has asked the Security Council to temporarily defer ICC prosecutions through the invocation of Article 16 of the Rome Statute. Doing so will undoubtedly lead to accusations that the Security Council is actively endorsing impunity in Kenya. But will that stop them? Recent reports have suggested that Western diplomats are busy drafting a Security Council resolution to defer the Kenya cases. This is significant. Presumably ‘Western’ powers – especially the US and ICC member-states France and the UK – are the key to any resolution passing. A veto from any of them would ruin Kenya’s chances at a deferral – although it should be noted that such a resolution is unlikely to ever come to a vote unless it is guaranteed to pass in advance. This isn’t the first time that the Security Council has seriously contemplated a deferral of ICC prosecutions. The possibility of a deferral arose in the case of Sudanese President Omar al-Bashir, as a reward for allowing South Sudan to secede peacefully in 2011. The UK supported a deferral but it was eventually kiboshed by the US. Just a few months ago Kenya asked the ICC to defer the cases against Kenyatta and Ruto but made little-to-no headway. So what has changed? The above statement suggests two primary reasons for a deferral. First of all, the Westgate mall tragedy has dramatically changed the political landscape in Kenya. The horrific attacks in Nairobi by al-Shabaab have put the need for stability and order in Kenya under the international community’s microscope. They have also had the effect of bolstering the argument of those who maintain that Kenyatta and Ruto cannot attend trials in The Hague and effectively run a country at the same time. Ruto himself used the tragedy to suggest as much. Crucially, the Security Council powers can now claim that a deferral of the Kenya cases is a matter of international peace and security. This is essential if an Article 16 deferral is to pass. Second, Western states want to continue ‘normal’ diplomatic relations with Kenya. The country is a key regional economic and political power as well as a partner in the ‘Global War on Terror’. Kenyatta understands this. He has been quite deft at playing chicken with the international community over his trial. While maintaining that he will continue cooperating with the Court, Kenyatta has also had his allies suggest he would do otherwise. If he refuses to show up for his trial (scheduled to begin November 12), he’ll immediately be booked with an arrest warrant by ICC judges. At that point he’ll quickly become a pariah, perhaps not on the level of Bashir, but nonetheless someone who cannot travel freely or shake hands with many, if not most, of the world’s political leaders. This is something he undoubtedly wants to avoid. But Western states who see Kenya as a valuable ally also want to avoid this scenario. When they say “Kenyatta is not Bashir”, they aren’t comparing the two leaders’ records when it comes to atrocities; they are saying: “we still want to deal with him.” While the focus has been on what will happen to Kenyatta’s travel plans and Kenya’s diplomatic relations if an arrest warrant is issued by the Court, Western states are just as worried that their own diplomatic relations will be disrupted. A deferral would avoid all that. But how can the Security Council justify this decision? First, as noted above, Security Council states will claim that any deferral is a response to a genuine threat to international peace and security. Second, those Security Council member-states that are also members of the ICC could argue that a deferral is a good thing for the Court, that a deferral will protect the Court from growing controversy over its role in Kenya and the African continent more broadly. At this point, no situation has produced as much controversy nor so deeply embroiled the ICC in political machinations as Kenya. Many pro-ICC observers may be inclined to agree that a time-out in the Kenya cases wouldn’t be such a bad thing for the Court. While understandable, the problem with this view is two-fold. First, it disregards the experience of victims and their expectations that justice be served. As one ICC official told The Economist, “The deferral suits everyone apart from the victims”. Secondly, it isn’t clear that a deferral would, in fact, protect the Court. Yes, taking a breather would give it some space from a contentious and hyper-political case. But it would also act to further entrench a very troubling trend, namely the tethering of Security Council prerogatives with the Court’s mandate. It will bring the politics of the Security Council and the justice of the ICC even closer – something which is at the very root of the ICC’s perception crisis. Still, there remains a real possibility that deferral will pass. In the week since the proposition was first reported, the response of NGOs, political actors and the media has been (largely) muted. There has been no mass public outcry. For Western states, this is crucial – it suggests that the reputational costs of allowing a deferral to pass aren’t too high to bear. The stakes are high for all parties involved – Kenya, the Security Council and the ICC. The ‘winner’ may end up being the party that loses the least. Who will that be? Right now, it’s anyone’s guess. This is a cross-post from Justice in Conflict. Mark is a PhD student in International Relations at the London School of Economics. His work focuses on the nexus of international criminal justice and conflict resolution. Specifically, he is examining the effects of the ICC on peace processes and negotiations in northern Uganda and Libya.